Anyhow, I've been told not to worry for years by those who live in ivory towers and speak dogma - once we outsource a big chunk of jobs, it will make other countries middle class well off.... whom will one day have more disposable income to buy U.S. goods. That are built in the foreign countries. Which somehow will lead to U.S. jobs. For example....McDonald's burgers (staffed by locals), and Apple iPhones (assembled in China). [Oct 4, 2010: WSJ - Americans Souring on Free Trade as Losing Their Jobs Overpowers Lower Prices] Don't ask questions, just believe it will all work out in the end. I am not sure when the tipping point will be reached but as I said in 2008 we are approaching a point where for many (not all!) 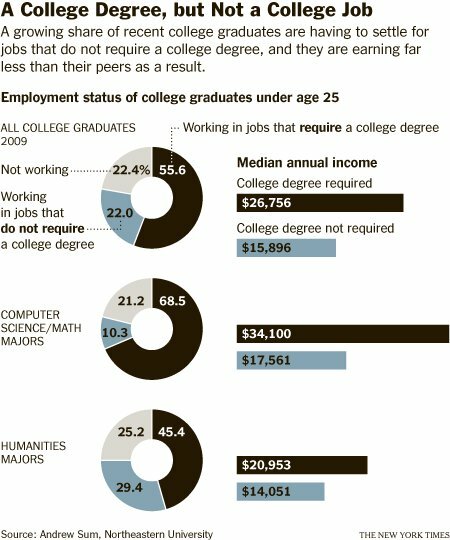 going to college, incurring massive debts, and then entering a job market where many of the jobs they once had have been outsourced (and continue to be) or eliminated via automation/productivity improvements, will simply be a losing proposition even accounting for the 'higher pay' in the long run. I don't know when the college bubble bursts but eventually it will face the same end as all bubbles. Employment rates for new college graduates have fallen sharply in the last two years, as have starting salaries for those who can find work. What’s more, only half of the jobs landed by these new graduates even require a college degree, reviving debates about whether higher education is “worth it” after all. Of course, these are the lucky ones — the graduates who found a job. Among the members of the class of 2010, just 56 percent had held at least one job by this spring, when the survey was conducted. An analysis by The New York Times of Labor Department data about college graduates aged 25 to 34 found that the number of these workers employed in food service, restaurants and bars had risen 17 percent in 2009 from 2008.. There were similar or bigger employment increases at gas stations and fuel dealers, food and alcohol stores, and taxi and limousine services. 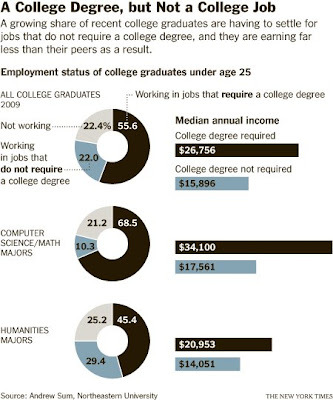 And when college majors are busy waiting tables, being baristas, or selling liquor and gas - it has a cascading effect. And about those loans the federal government is just dying to hand out so that the massive Ponzi scheme called the college tuition bubble can escalate?